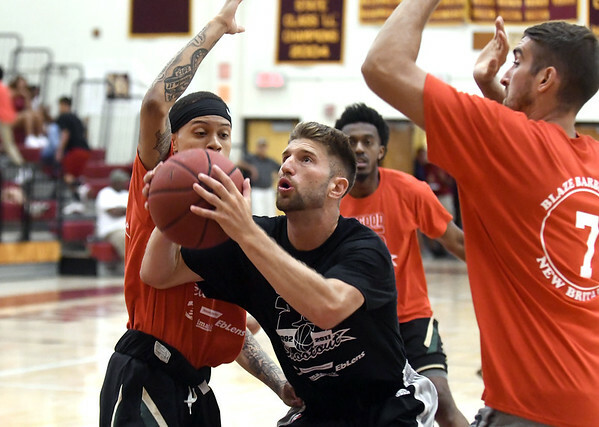 NEW BRITAIN - The 26th annual Osgood Shootout is set to kick off Saturday at New Britain High School and for the man behind it all, it’s always been about the same thing. The six individuals receiving scholarships are Inanna Rice, David Rybczyk, Chelsea Anthony, Erasmus Gunawan, Adele Carr and Jaylen Rivera. This year’s Osgood Shootout scholarship award recipients are Rivera (Post University), Carr (University of Maryland), Gunawan (UConn) and Anthony (UConn). All will be awarded $500. The Albert A. Vieira Scholarship award recipients are Rybczyk (University of Saint Joseph) and Rice (Mitchell College). Both will receive $250. The Shootout also has a history of drawing in some top talent as one of the premier New England summer basketball tournaments. In the past, NBA players such as Kemba Walker, Jared Sullinger, Andre Drummond, Jordan Williams, Jerome Dyson, Jared Jordan, Ryan Gomes, Marcus Camby, James Thomas and Anthony Ireland have participated. While there aren’t expected to be any NBA players attending this year, there will be plenty of local talent on display. In the high school division, there’s kids from a lot of competitive basketball schools such as Sacred Heart, Waterbury, Windsor and Hamden. The first games will begin at 9:30 a.m. on Saturday with the final championship game starting at 5:45 p.m. on Sunday. CT Flight are the defending champions of the high school division and will be taking on the winner of Waterbury and Freedom in the second round. Team Shaw is facing Team Family at 3:45 p.m. Windsor is facing Green Dragons at 2:30 p.m. ASI is facing 300 at 9:30 a.m. with the winner taking on the Hearts at 5 p.m. The other division is the Open Division. In this division, the defending champions are AmeriKaz, who will receive a bye in the first round. Other competing teams are Blaze, Middletown, Bookers, Next Level, Theard City, Dem Boyz, 2 Official, Chauncey, Flight Fam, Ms. Blaze, PPF and Waterbury. Some names to watch out for in the Open Division are Kuran Iverson, Doug Wiggins, Mike Anderson, Don Hering, Darius Watson, Shon Jones and Roosevelt Lee. Anderson will be the top player for Flight Fam. He played college basketball at the University of Washington. Hering is another strong player expected to play for Flight Fam. Watson, a New Britain native, will be playing for 2 Official. He was a standout player at Albertus Magnus and is at the top of the school’s all-time leading scoring list. He averaged over 20 points per game in college. The Blaze will be a team with a lot of New Britain locals. A couple players to watch out for on the Blaze are Lee and Jones. The Blaze were the champions of the Shootout back in 2016. Posted in New Britain Herald, General Sports, New Britain on Friday, 17 August 2018 21:07. Updated: Friday, 17 August 2018 21:11.